Hello! Welcome to Taylored Expressions February Spotlight Day! Today is the day that the Baker's Dozen team spotlights the new release items! I have two projects to show you today. The first one uses Easter A la Carte. I made a 6x4 Project Life card. I will use this in my Project Life album during Easter week. I stamped and colored the A la Carte word/image, then I sponged on some clouds and sky. I also added some felt clouds (using the Cloud Duo) and a fence using the Picket Fence Border. I added the "happy" with wood veneer. My final project is an A2 greeting card. I used Graphic Greetings - Egg Hunt. I stamped and embossed this onto black cardstock and sponged the edges with White ink to create a chalkboard look. I notice that my efforts to achieve the chalkboard effect don't really look like chalkboard, so next time I do this, I'll have to be less neat... LOL! 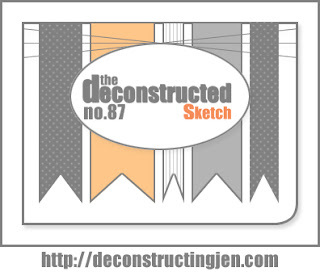 It's hard to tell in the photo, but I added a few banner strips (white on white) underneath my image/sentiment panel and used Jen's Deconstructed Sketch #87. The pink vellum butterfly was created using the new Elegant Butterfly Overlays. Accessories: Taylored Dies: Cloud Duo Die, Picket Fence Border Die; Marshmallow felt (Taylored Expressions), Mega Oval and Scalloped Mega Oval Nestabilities (Spellbinders), Markers (Copic), Wood veneer word – happy (Studio Calico), Foam tape, Thread, Sewing machine. Accessories: Taylored Dies: Elegant Butterfly Overlays, Banner Stacklets 1 (Taylored Expressions); Classic Rectangle Nestabilities – LG (Spellbinders), Pink twine (May Arts), Blush pearls (Kaisercraft) Foam tape, Thread, Sewing machine. 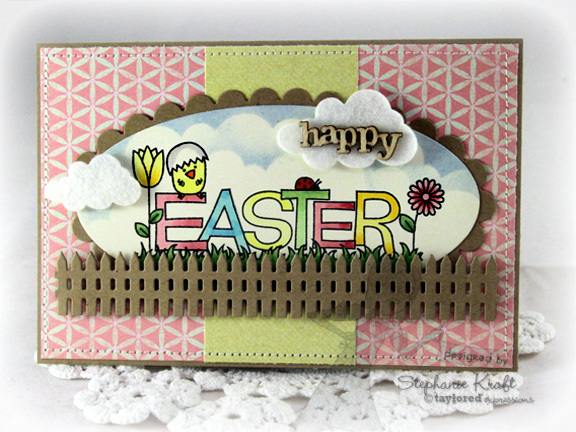 The fence and the felt clouds are such perfect little special touches for that Easter image! I also had fun trying out the chalkboard technique - aren't these GG stamps so perfect for it?! Terrific cards Stephanie! 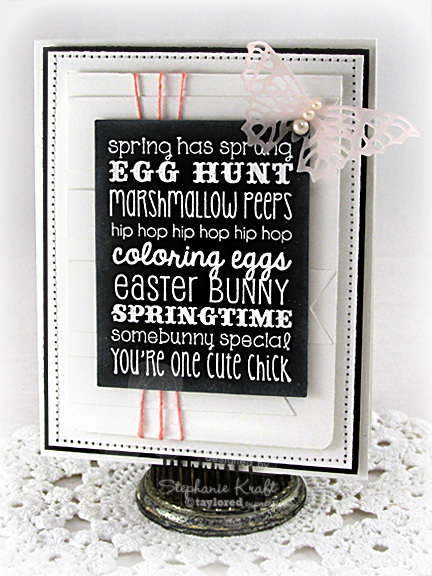 Love the cute Easter scene and the beautiful chalkboard card!